The five African artists featured in this exhibition explore how time is experienced—and produced—by the body. Bodies climb, dance, and dissolve in six works of art. Characters repeat, resist, or reverse any expectation that time must move relentlessly forward. Senses of Time invites viewers to contemplate tensions between ritual and technological time, personal and political time through pacing, sequencing, looping, layering, and mirroring. 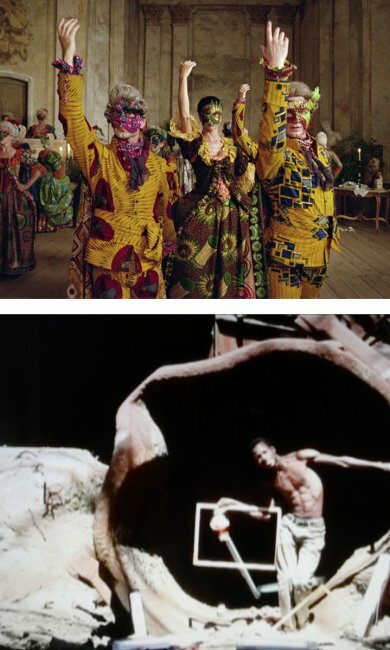 The exhibition features Yinka Shonibare’s cinematic Un Ballo in Maschera, in which European ballroom dancers in sumptuous African print-cloth gowns dramatize the absurdities of political violence as history repeats itself. Sammy Baloji’s Memoireexplores choreographies of memory and forgetting in the haunted ruins of postcolonial deindustrialization. Berni Searle’s ancestral family portraits are tossed by the waves of generational loss inAbout to Forget, and in A Matter of Time she performs the slipperiness and fragility of time and identity. Moataz Nasr’s The Water treads upon personal identities distorted by the march of time, while in Theo Eshutu’s Brave New World II, visitors are drawn into a captivating kaleidoscopic space where past, present and future converge.